At this time of year when the acorns are dropping, California’s acorn woodpeckers are busy. They store their nuts in a most unique way. A medium-sized woodpecker, Melanerpes formicivorus uses its bill to pick up acorns, one at a time, then flies each nut to a designated storage facility, called a granary. 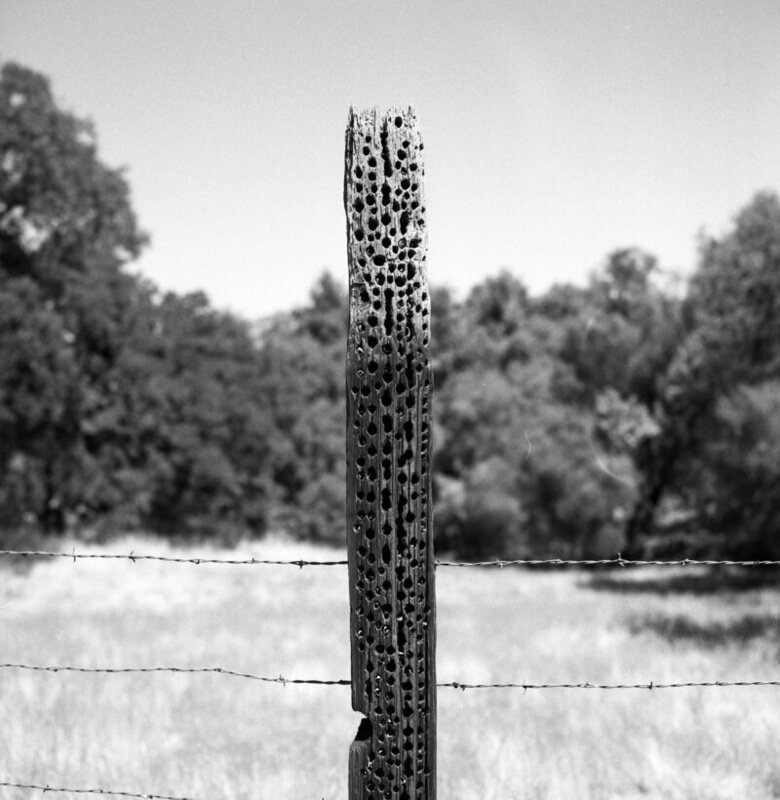 Usually granaries are dead oak trees, but sometimes they are man-made wooden structures, like a telephone pole or fence post. Last month I had the pleasure of taking my morning walks through a state park, and was enchanted by the large population of acorn woodpeckers. As I walked down the lane, I spotted the characteristic dip of the woodpecker flight pattern, and heard their delightfully raucous voices. Such an attractive bird, with their bright red-capped heads and flashy red, white, and black markings. Every day I saw at least 20 acorn woodpeckers. Here in California we see granaries often. From a distance it looks like a dead tree; but when you get close you see the tree trunk is filled with holes. 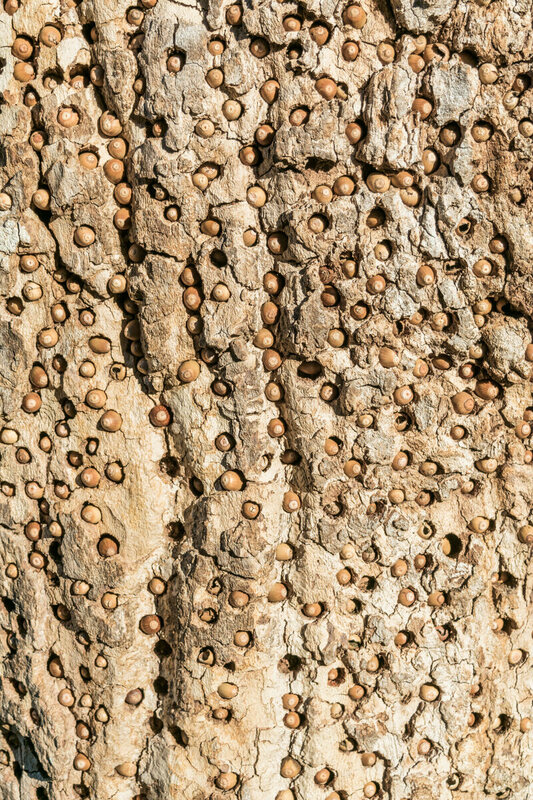 Upon closer examination, each hole has an acorn stuffed into it. The social structure of acorn woodpeckers is extensive and complicated, with cooperative breeding and large family groups. Not only do they tend their nests together, they also build their granary together. There’s an ancient phrase that’s goes something like…a granary wasn’t built in a day. Each granary is a culmination of years of acorn gathering. A granary can be pocked with thousands of acorns and perfected over a decade. The woodpeckers actually work all year long on their granaries, but this time of year is especially exciting when the acorns have become harvestable. Building the granary is only half of the work; maintenance and protection are also important. To keep other birds and squirrels from stealing the precious nuts, each acorn is tightly fitted into a hole. The woodpecker has a sharp bill and excavates the hole, then pounds the acorn in with no extra space, making it difficult to be removed. Over time, however, the old, dry acorns tend to shrink. When this happens, the woodpeckers remove the loose acorn and find (or create) a smaller and more suitable hole. 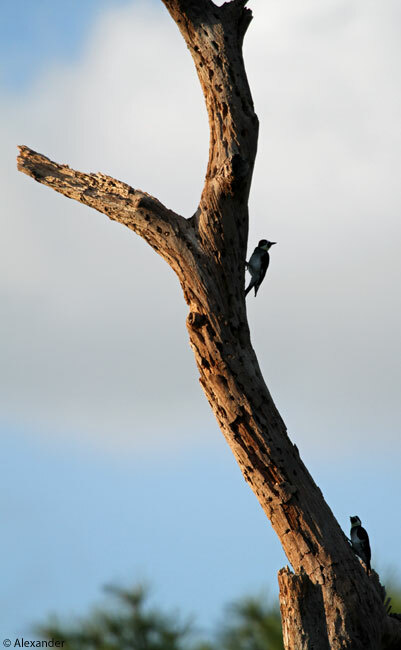 Acorn woodpeckers also eat insects, other nuts, lizards, seeds, grass, and more. This bird species, dependent on oak trees, lives primarily in the western and southern parts of the U.S., as well as Mexico and Central America. We are lucky to see them all over California. See range map below. Excellent short video of acorn woodpeckers at a granary: Click here. With their clown-like look, colorful markings, cheerful laughter, and productive activities, this bird will bring a smile to your face even before you see their masterpiece. Photos by Athena Alexander, unless otherwise specified. That sums the acorn woodpeckers up well, Bill — thanks for bringing a smile to my face. Ambitious little planners, aren’t they. This bird doesn’t touch down in Las Vegas or MI, so you’ll have to venture to Calif. or the US SW to see one; but I’m glad I could give you a glimpse through today’s post, John. Always lovely to have you stop by, thank you. I saw the range map, no where near here. Always good to see you here Jet! Thanks for the re-blog, huggers. Great post, Jet! I’ve always loved Woodpeckers…except when they’re pecking on our house early in the morning. That’s for sharing your amazing photos! How are things working out at home? We are lucky in this country to have 22 different woodpecker species, and Florida has so many bird species in general. We have moved back home and are working on getting settled in. All of our storage bldgs. were incinerated, so putting things away is a little tricky right now, but it’s going well. Thanks for asking, Eddie. Always a joy to “see” you. Something new for me today. I’ve never even heard of them. Lots of woodpeckers around here, but none like that. I love your posts, Jet. What a cool bird. Hugs on the wing! Oh how very wonderful to connect with you today, Teagan. Thanks for your words and hugs. I’m heading over your way right now. Wow, what an industrious little bird! They are so industrious. Thanks so much, Joanne. What an amazing bird! Thank you for this informative post! Glad you enjoyed the acorn woodpeckers, Hien. Not a bird you see on the east coast, but maybe you’ll see one next time you’re out here in the west. Wow, those granary’s are amazing, and the birds too! Glad you liked it Bertie. It is curious to come upon one, always like finding a treasure. What a delightful post – about a delightful bird! And the video is great. I’m so glad I was able to walk that path in the park with you and see these lovely creatures in person! That is a great video, Nan, I’m glad you had a moment to watch it. Marie Read is an outstanding photographer and videographer. And I, too, am glad we walked that lane together and saw the acorn woodpeckers flashing about. Great memories. They are birds that make their presence known, that’s for sure. Our’s are a bit on the scruffy side and can be quite loud. But then they have to battle with the jays and the ravens! haha Jan, yes battling jays and ravens would make anyone scruffy. Thanks for the smile today. That is so interesting, and they sure know how to store the acorns! They sure do know how to store the acorns! Always a delight to see you, Amy, thank you. What a fascinating and informative post, Jet. I see them often but didn’t know much about granaries. Amazing! Great photos, too. They’re such a flashy bird, I’m glad you see them often, Jane. And now you know to look around for a granary, especially if you see a lot of them. Many thanks. I am happy to introduce this lovable woodpecker to you, Val. Thanks so much for your visit today, always appreciated. What an amazing bird. Wonderful photos too and the video you link to is great. I loved the description in it of their call when they get together- “wacka wacka”! Really enjoyed your comment, Alastair. Glad you had the chance to see the video, it’s a good one, and I, too, like the “wacka wacka” description, because that is truly what it sounds like. It is quite amazing how many woodpeckers we have on our planet. There are some countries, like Australia, who do not have them; but most countries do. Interesting that there are only three in UK, but wonderful that you hear them. I always enjoy your visits, Alastair, thank you. Wow, that’s fascinating! And what a gorgeous bird. Glad you enjoyed the acorn woodpecker today, Janet — thank you. What wonderful looking birds, and clever too. We don’t see them here so your post was a real treat! …and what a treat for me to introduce you to the acorn woodpeckers, Belinda. Thanks so much for your visit and comment. There doesn’t seem to ever be any in-fighting, HJ, so I think the acorn food supply in the granary is a community smorgasbord. They are fascinating and comical to watch, and make a lot of noise when they are all together, which only adds to the fascination. Glad you found the post interesting, HJ, and as always, your warm comments and visit are so appreciated. They seem to be feathered soul mates of the grey squirrel. They do have many similarities, montucky, the acorn woodpecker and the gray squirrel. 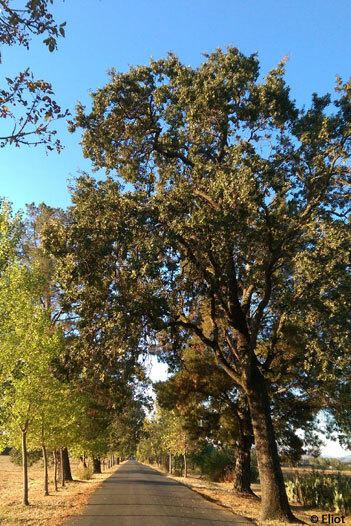 Hanging out in oak trees and gorging on acorns. We’re lucky to have both where I live, and they entertain me often. Enjoyed your comment, got me thinking about their similarities, thank you. What extraordinary and complex behaviour! The face reminds me of European goldfinches. I haven’t seen an Acorn WP yet. Lovely post Jet. I’m glad I could bring this western bird to your east coast eyes, Sherry. Always a pleasure to have you visit…. I have never seen such an granaries! Fantastic!! I think they’re fantastic too, Simone; and am delighted you enjoyed the granaries. Thank you! Jet that is one of the most incredible things I’ve ever seen. Growing up on a farm the term granary is common to the rural vocabulary. To see these granary trees and the acorns being stored is fascinating. I so enjoyed the video. As always Athena’s photos are exquisite. Not a visit to this blog goes by when I don’t learn something. Wouldn’t it be amazing to have a time lapse video over months of the acorn tree being filled up? Oh so fun to receive your kind words, Sue, thank you. I like your agricultural understanding of granaries, and am delighted to have introduced a new aspect of them to you with the acorn woodpecker. Always a joy to share the marvels of this planet with you, Sue; you’re such an eager recipient. What clever birds! Loved your post! I’m happy to have shared this clever industrious bird with you, Susan. Thanks so much for your visit. Thanks so very much, David. I like thinking of it–to use your words–as “decorative food storage.” Oh you always give me a spark of a smile, thank you. The range of this Woodpecker extends to Costa Rica. However Granaries are not as big or just not made here. Nice post! Thanks for stopping by, Eduardo, I’m glad you enjoyed the acorn woodpecker post. I’ve never seen an acorn woodpecker before, living here on the east coast. How fascinating that they live in groups and create granaries! I love the red-bellied, downy and hairy woodpeckers who visit my suet feeder, but they seem to be solitary birds. Your acorn woodpeckers are beautiful! I enjoyed hearing about the woodpeckers who visit your suet feeder, Barbara. In the east coast’s cold season, suet is such a good provision for the woodpeckers. 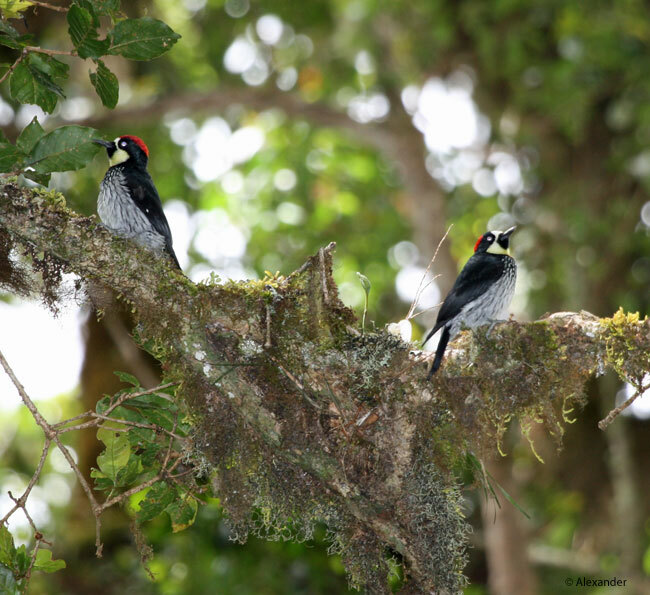 Glad I could share the delights of the acorn woodpecker with you. Thanks so much. They’re absolutely wonderful birds, and they occasionally will find a new way to satisfy their need to stash acorns. For a while, it was thought that squirrels put a California microwave antenna out of service, but once the experts from the Cornell Lab got involved and evaluated the facts of the case, it was decided that the acorn woodpecker was the culprit. I was going to post just the video, but I found this page that includes some still photos, along with more detail and the video itself. It’s at the end of the page. The antenna was filled with about 300 pounds of acorns, and the folks from Cornell thought the woodpecker might have been busy stashing acorns for five years or so. I knew I’d find someone to share this with, some day! Thanks for your wonderful post, and for giving me the chance! I sure did enjoy this video, Linda, thank you. They opened up that lid and it just started raining acorns! I liked that the oak trees were in the background in that final shot, too. 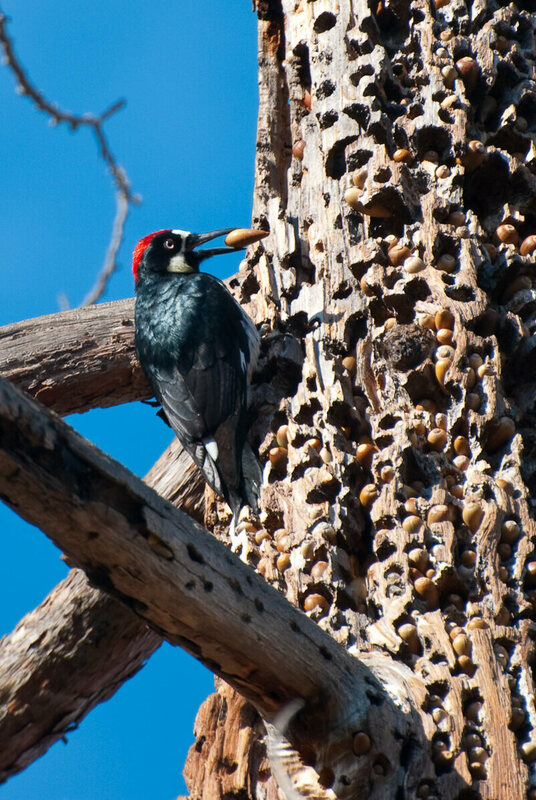 Proves how clever, creative, and industrious the acorn woodpecker is. Thanks so much, and yes, how appropriately precise to be able to share the video here. An absolutely fascinating account of the acorn woodpecker, Jet,; thank you for sharing your thoughts and photos. Although I’ve seen the species before, I wasn’t aware of its granary activities, squirreling away acorns for the future, with such precision and workmanship. Wonderful, indeed. What a super interesting post. SO thats why woodpeckers do what they do!! I love the first photo and also the one of the acorns filling up the tree. So very interesting and informative. Thanks so much for the education on these beauties. Always a joy to have you stop by, Peta, thanks so much. I’m glad you enjoyed the acorn woodpeckers. I had no idea….incredible, I am just blown away! Not only the physical building of the granaries, but the community effort…nature never ceases to amaze me and I so appreciate you sharing this!! Another great post Jet!! Thanks!! I, too, love the ceaseless wonders of nature, Kirt. Always great to hear from you, thank you. What an informative post. I always learn something neat when I visit here. Hope your restoration and settling in is going well! My guess is you’ve see the acorn woodpeckers at work out west, Gunta. Thanks so much for your visit. Things at home are going pretty well, thank you. I rarely see any woodpeckers. Seeing an acorn woodpecker do his thing would be an extra treat. Yes, it is an extra treat to see the acorn woodpeckers industriously working away. I’m glad I could share it with you, Dave. Thanks for stopping by. We don’t have them here either, but sure would love to! Woodpeckers are such characters. Great post, Jet. Woodpeckers are indeed “characters,” Anneli. Enjoyed your comment, thank you. Wonderful post and video! I’d love to watch these industrious and sociable little birds one day, and see the granary holes, quite amazing. I’m glad you were able to take a moment to watch that acorn woodpecker video, pc. You and Mrs. PC do get around, so I am quite certain you will see them in action one day on one of your many outdoor adventures. Glad I could entice you with the post, and thanks so much for your lovely visit. It is a very clever way to protect one’s cache, I agree, RH. But I’m glad I don’t have to do it for my stuff. 😉 Thanks so much for your visit. I found this very interesting and informatiove, Jet! I have never seen a granary like this! Oh so wonderful that I could share the marvel of the acorn woodpecker granaries with you, Helen. Maybe sometime in your many travels when you’re out in the western U.S., you will get a chance to see one. If you are ever out near SF, please do email me. What a smart and handsome little fella! Thank you for sharing! Yes, they are smart birds, the acorn woodpeckers…glad you enjoyed them Inese, thank you. The Acorn Woodpecker is absolutely fascinating, how cool are the granaries!! Thank you so much for sharing, Jet! Always a treat to come upon a granary — glad you enjoyed these today, Donna. Thank you. you always have something very interesting Jet! You should start your own nature show going to different parts of the world! 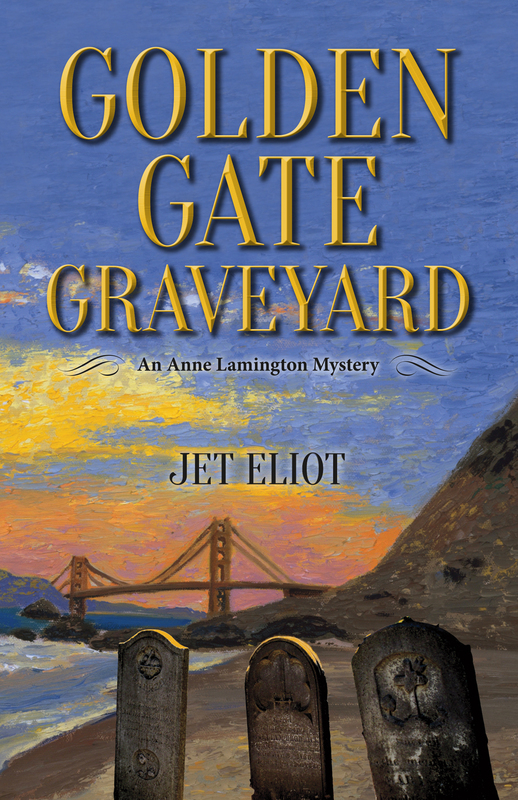 Call it”Jetting Around”! Gave me a chuckle, Wayne, with “Jetting Around.” Glad you enjoyed the acorn woodpecker granaries…and thanks for the smile today, much appreciated. Thanks so much, Matthias — those acorn woodpeckers are hard-working and adorable too. i would love to see one of these granaries! I am happy to have introduced you to the acorn woodpeckers and their granaries, Katy. Thanks so much for stopping by. The next time you’re in Calif. you will know what to look for. And just listen for the “wacka wacka” when you’re out walking in wild places where there are oak trees.